About the Author: Josh White is the Associate Head Coach for the University of Michigan Swim and Dive team. He helped coach Connor Jaeger throughout his four-year collegiate career and has a Ph.D. in Human Performance from Indiana University. 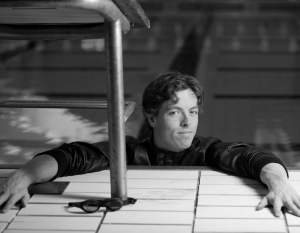 Connor Jaeger is an incredible swimmer, but that hasn’t always been the case. He was good, but he didn’t break any National Age Group Records. His story, like his swimming, is defined by endurance and balance. When I describe his meteoric rise since coming to the University of Michigan, please understand that he has been developing the physical and mental capabilities that allowed this explosion throughout his entire life. Swimming has been a tool for his personal development, whereas his approach to life has allowed him to become an incredible swimmer. Connor had a great support system growing up. 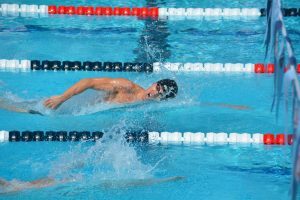 His club coach set him up for success by developing his aerobic capacity, his muscular capillarization, his feel for the water, and more. She also wrote us a nice letter after Connor decided to come to Michigan. I remember it now (almost six years later) because she didn’t tell us that he was the most talented person she had ever worked with. Instead, she wrote that he was an incredible person with great values and care for others. 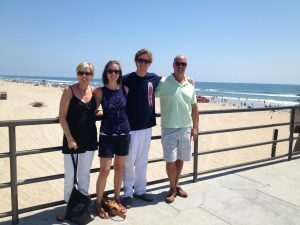 Connor’s parents support him without attempting to control his swimming career. They celebrate Connor’s success and feel for him when he doesn’t achieve his goals, but they always understand that Connor’s swimming is about him and not about them. They have also been incredibly gracious with us as his coaches and supported us just as they do him. They frequently get in touch with a kind word or note. We have never heard from them about technique, training, or really anything to do with the swimming at all. Together, his coach and parents helped him develop a great work ethic, the ability to focus on the process instead of the outcome, and a mindset that doesn’t place limits on his performance. Combining these skills with the incredible training environment and world-class teammates at the University of Michigan, Connor improved at a rate no shorter than amazing. Connor joined our team at Michigan as a freshman in the fall of 2010. For a future NCAA Champion, Olympic Finalist and World Championship Medalist, one might expect that he was a highly recruited stud. On the contrary, he was a solid swimmer but would not have been considered a top recruit in the class. To top it off, Connor had been stricken with mono during the summer prior to his freshman year and came in to school still suffering from some side-effects. On his arrival, we were quick to recognize his work ethic and capacity to make changes both in his swimming technique and in his life. Connor’s development as a swimmer could best be described by a coach as a “once in a lifetime” occurrence. He improved markedly as a freshman, and his year was highlighted by a 13th place finish at the Big Ten Championships in the 500 Freestyle. Connor was also a member of our Big Ten Champion 800 Free Relay team, qualifying to swim at the NCAA Championships. However, we had a very deep team in the 200 free and one of his teammates had been performing considerably better in the individual event. Ultimately, we chose not to take Connor to the NCAA meet. While many athletes may not have reacted well, Connor understood that this decision was in the best interest of the team and was both supportive of the team and rededicated himself to training for the club season in the summer. As we often see, Connor’s training advanced to the next level before his success in competition did. I think that this is an important lesson for young swimmers. You have to see yourself improve every day in training before you will see it happen in meets. At Michigan, we strongly believe in seeing technique, strength, and fitness develop together. This was particularly true with Connor. Connor’s freestyle technique improved considerably throughout his freshman and sophomore years. 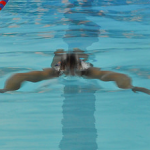 This took a lot of instruction and repetition while doing stroke work, but his new stroke also required greater strength and fitness in order to be able to hold it throughout practice or a race. While we had seen Connor’s incredible potential in training during his freshman year, we first began to see it realized in competition that summer. 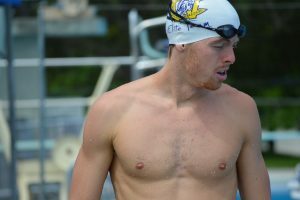 Connor swam his first ever qualifying time for the Olympic trials at the beginning of July of 2011 in the 400 m Freestyle (3:58.3). By the end of the summer, Connor dropped to a 3:53.4 and finished 10th at the USA Swimming National Championships. Up to this point, it might surprise you to learn that Connor had never swum the mile. 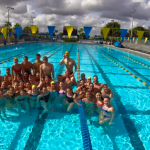 Connor had an incredible opportunity to train with Sean Ryan and Ryan Feeley, who were also swimmers at the University of Michigan. 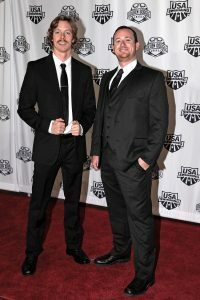 These two were and still are among the top distance swimmers in the country. Every week, Connor became more and more competitive with them, even on the longest sets. We started to believe that he could have potential in the mile. While many great swimmers shy away from competing in the mile and the accompanying torturous training, Connor was excited to have the opportunity to push himself out of his comfort zone. He quickly excelled qualifying for the Olympic Trials the first time that he swam it in November of 2011 in a time trial by himself at the Minnesota Grand Prix. Eight months later, Connor had qualified for the US Olympic Team in the mile. His rate of development was unheard of for a 21 year old. It was only one year earlier that he had made that first Trials cut in the 400 at 3:58 and now he held faster than that pace for the entire 1500, swimming a 14:52. The rest of Connor’s swimming career is much more well known. Connor went on to finish sixth at the 2012 Olympic Games, win 3 individual NCAA Championships (and a team championship, go Blue! ), win a bronze medal at 2013 World Championships, and become the first ever American to win the 1500 at Pan Pacific Games in 2014. Connor has earned every single piece of his success through hard work, dedication, and commitment to the team. Now, back to the enigma and the most incredible quality of this amazing man. As coaches, we frequently see people who end up in one of two camps: those who set high (and sometimes unrealistic) goals, or those who don’t allow themselves to believe in the possibility of reaching the highest levels of the sport. Connor not only achieves the perfect balance of setting realistic goals, but also does not place an artificial ceiling on his abilities. In the summer of 2013, Connor was interviewed at the Charlotte Grand Prix Meet after almost setting a personal best in the 400 freestyle. During the interview he was asked how he managed to continue to swim personal bests in spite of the heavy training load he was enduring right before the meet. He responded, “I think it is just because my best times aren’t very good.” This statement is amazing because Connor was the sixth fastest swimmer in the entire country in the 400 the summer before. I think this epitomizes much of Connor. He is managing to be both humble and confident at the same time. His humility lets him believe that he isn’t as good as he could be, while his confidence in his ability to improve takes him to unfathomable heights. While the characteristics that I described above are the most direct contributors to Connor’s successes, they are not even his most admirable traits. Connor is a good person. He cares for his teammates and his community. His character and awareness of others give him an incredible capacity for leadership. Connor was elected as a team captain following his sophomore year, but out of respect for the rising senior class, he turned down the position in order to help the team dynamic. Following his junior year, he was once again elected as a captain and was listed on every single ballot. Connor has always used his pulpit to encourage others in the right direction, and his credibility allows him to criticize constructively. As one of the best swimmers in the world, it would be easy for Connor to be focused solely on his own success; however, he constantly goes above and beyond expectation by having peripheral sight on the world around him. In the summer of 2013, Connor qualified for a coveted relay spot at the World Championships on the 800 Free Relay. Having already qualified for the meet in another event, Connor understood that one of his training partners, Michael Klueh, had missed qualifying for the relay by less than a tenth of a second and was next in line for a position on the team. After warming down, Connor came to see us and the first thing that he did was ask if he could turn down his position so that it would go to Michael. Believing that this might be a gut reaction, we waited to pursue this until seeing if he still felt the same way the next day. Sure enough, unsolicited, Connor came back to the coaching staff once again to ask if giving up his spot was possible. Through Connor’s selflessness, Michael had the opportunity to travel to Barcelona and be part of a gold medal winning relay at World Championships. There may be some athlete’s who excel with selfish and egocentric attitudes. We see them every day on TV. But due to my experience working with Connor and other swimmers like him, I will always believe that they could have been not just better people, but better athletes if they understood the concept of team and cared about those around them. At the University of Michigan, we preach this to our swimmers every day. We hope that they can learn these lessons through the sport and subsequently apply them away from the pool to make the world a better place. Connor does this each and every day.